They go by names such as Vitamin Drip Bar and Liquid Vitamin Lounge. You’ve probably seen the store front right next to your local Target. What they’re selling is nutrient IV – as in intravenous – therapy. Its claims range from being able to boost your low energy, spice up your libido, and instantly recover from a cold or a hangover, to improving chronic health conditions such as arthritis, asthma, and even immune disorders. These days, ‘IV infusion therapy’ has grown in cult popularity like a vaping lounge. Mobile IV clinics and store fronts offer quick cures and transformative wellness benefits. Proponents claim IV nutrient delivery is necessary because taking high doses by mouth is simply not possible because digestion limits absorption. Really? By definition, a nutrient is something found in food, which we eat and our bodies break down at a rate appropriate to need, and ultimately put to use for the optimal function of the body. That is what nature intended and it works very effectively so long as illness or injury does not interfere with nature’s beautiful design. 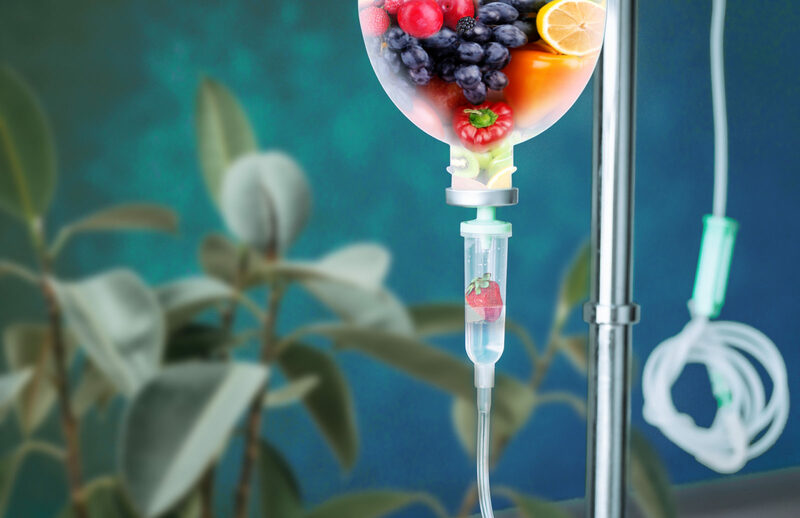 Bypassing nature’s design via IV cocktails puts nutrients into the bloodstream very quickly and in very high amounts. This can stress vital organs, not just in the digestive tract, but also the liver, pancreas, and even the circulatory and nervous systems. Just as concerning is having a technician who has inadequate medical training deliver a nutrient cocktail that potentially interacts with other medications a person may be taking. There is a role for IV nutrients in medical treatment as well as in holistic health treatment of a select few medical conditions for patients who are carefully screened by qualified holistic physicians. For the rest of us otherwise healthy folks, we need to do as Mother Nature intended and obtain our nutrients through a healthy diet of fresh, whole foods or nutritional supplementation – and there’s no hype about that. This entry was posted in Articles and tagged infusion, iv therapy, nutrients.